Welcome back to third grade! 12-15-12 Craig sands the table top in order to make the surface more porous. The first coat rolls on smoothly. 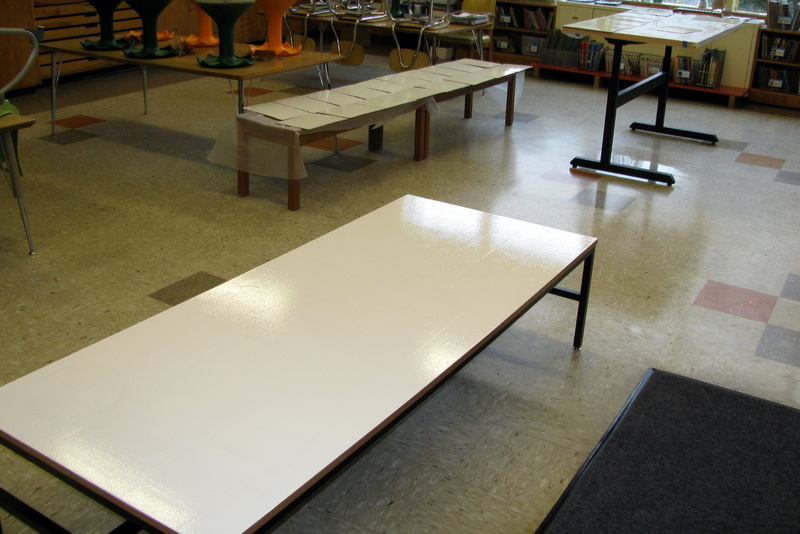 12-19-12 The low dry erase table is ready for use. Extra paint was used to touch up dinged up dry erase boards. Seating Choices: Students select their own seats each Friday for the following week, and they must choose wisely. On Monday morning, everyone is subject to the three-strikes-and-you’re-out rule. If a seating arrangement is too distracting to each other or their tablemates, an individual receives a reminder. If this happens three times in the course of the day, one round of classic Rock, Paper, Scissors determines who is relocated. 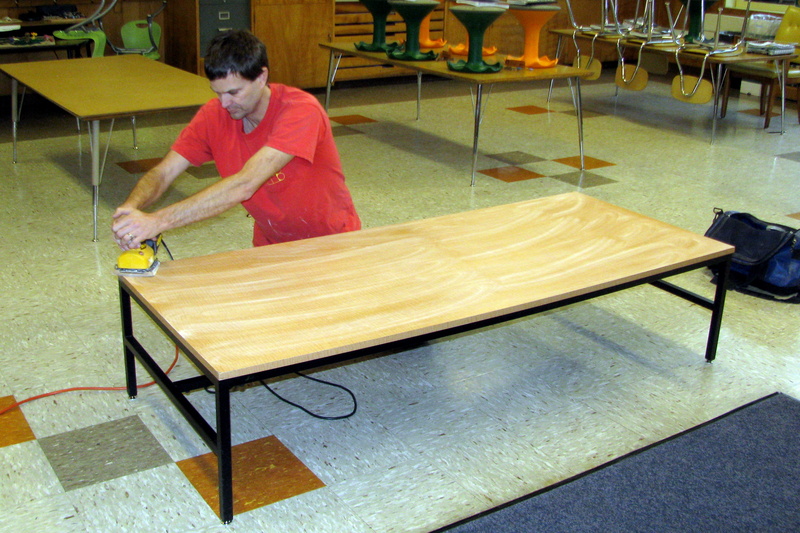 Our school librarian spotted two low tables at a furniture warehouse clearance and rescued them. She hoped they would find a good home at Lewis Elementary, and they have. 2010 was my first year of teaching, and I was in charge of a kindergarten class. We used one of the salvaged low tables to hold tubs for Independent Worktime stations. It was a great height for five year olds. When I moved to Room 17 a year later to teach third grade, I wasn’t sure the low table would be beneficial. However, the more I thought about classroom design and the needs of a wide variety of learners, I decided to keep the low table in the configuration. Six carpet squares were purchased from a local flooring store and placed on the floor of Room 17, divided equally between two sides of the low table. I was quite surprised how much my students enjoy sitting in this fashion. Even the children on the taller end of the third grade spectrum are flexible enough to enjoy the seating arrangement. Their long limbs fold and contort in ways that would impress a seasoned yoga instructor. 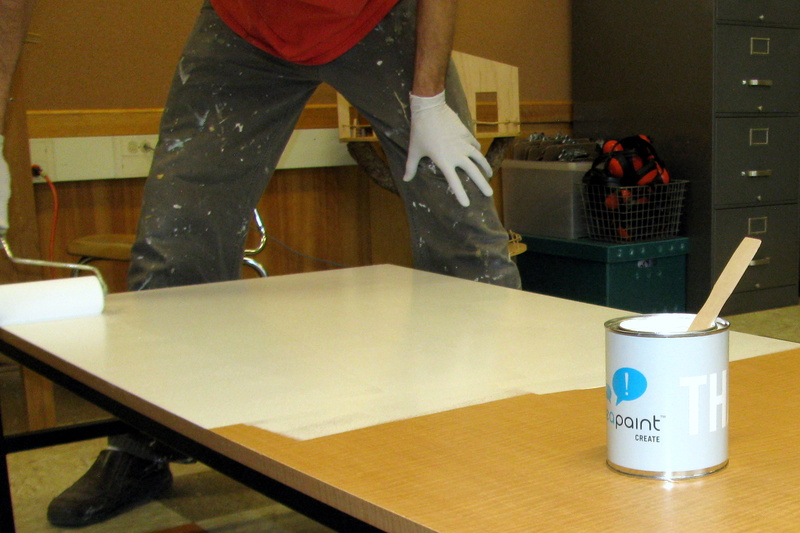 I wish I could recall when I first heard of Idea Paint, but alas, that moment is long gone. Whatever the introduction, the product itself made a lasting impression on me. I put together a DonorsChoose request along with Zuma chairs, and it was fulfilled. Over Winter Break of 2012, my handyman husband agreed to prepare the low table and put on two coats of Idea Paint. Incorporating Idea Paint in Room 17 has been a terrific asset. 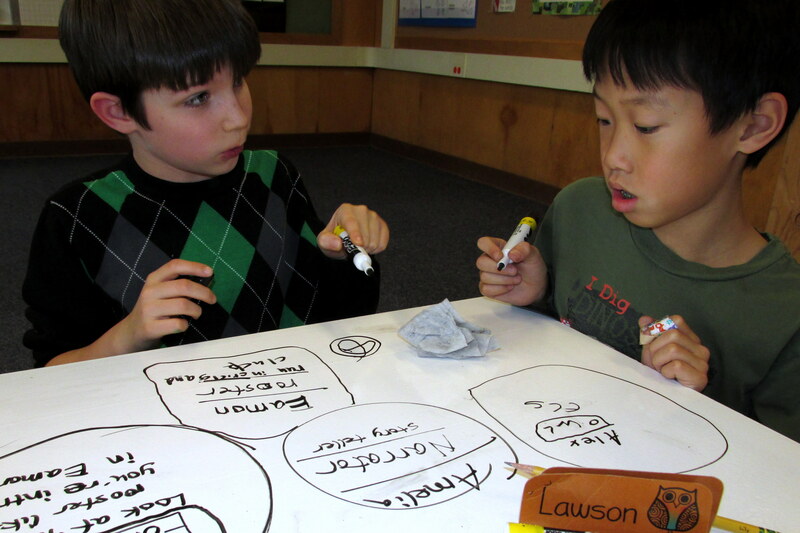 Students are encouraged to share their thinking by using dry erase markers on the tabletop. It is thoroughly engaging, collaboration is purposeful, and I get a clear overview of their thought process and work. I am able to provide immediate feedback, which is so important in formative assessment.